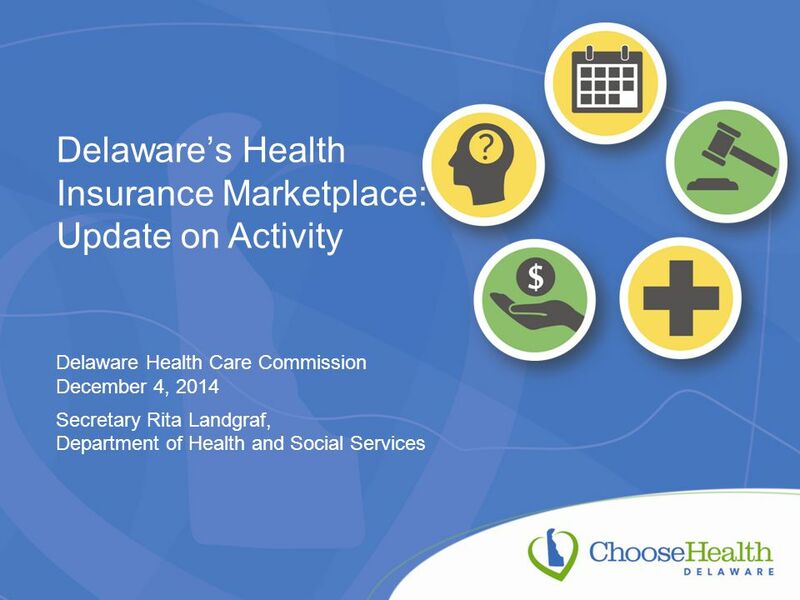 Delaware’s Health Insurance Marketplace: Update on Activity Delaware Health Care Commission December 4, 2014 Secretary Rita Landgraf, Department of Health. 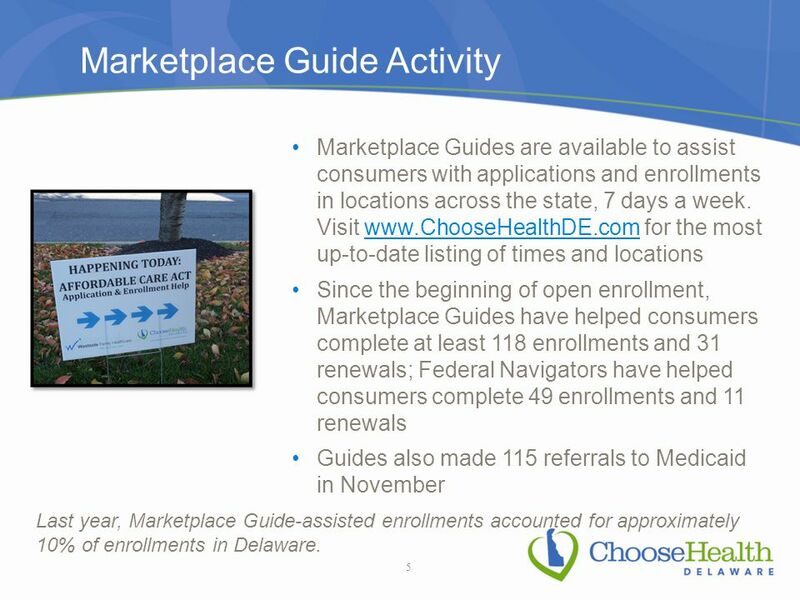 5 Marketplace Guide Activity Marketplace Guides are available to assist consumers with applications and enrollments in locations across the state, 7 days a week. 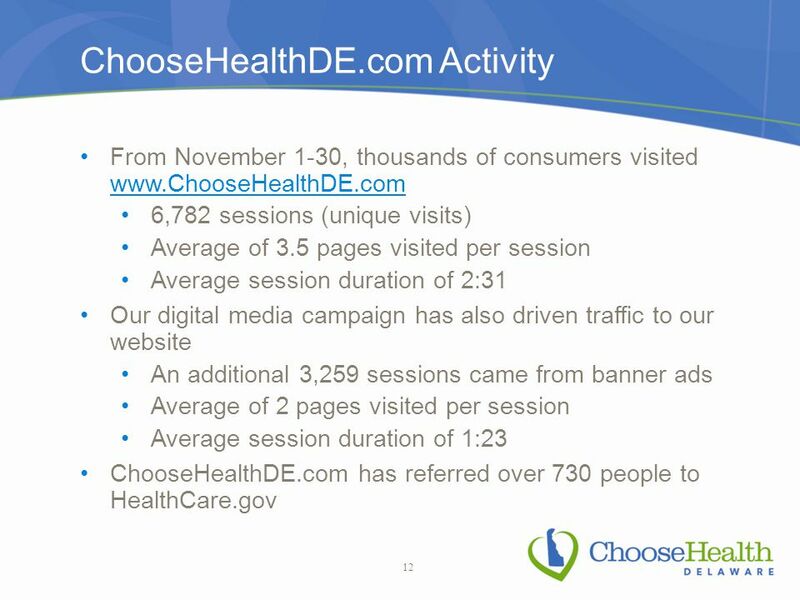 Visit www.ChooseHealthDE.com for the most up-to-date listing of times and locationswww.ChooseHealthDE.com Since the beginning of open enrollment, Marketplace Guides have helped consumers complete at least 118 enrollments and 31 renewals; Federal Navigators have helped consumers complete 49 enrollments and 11 renewals Guides also made 115 referrals to Medicaid in November 5 Last year, Marketplace Guide-assisted enrollments accounted for approximately 10% of enrollments in Delaware. 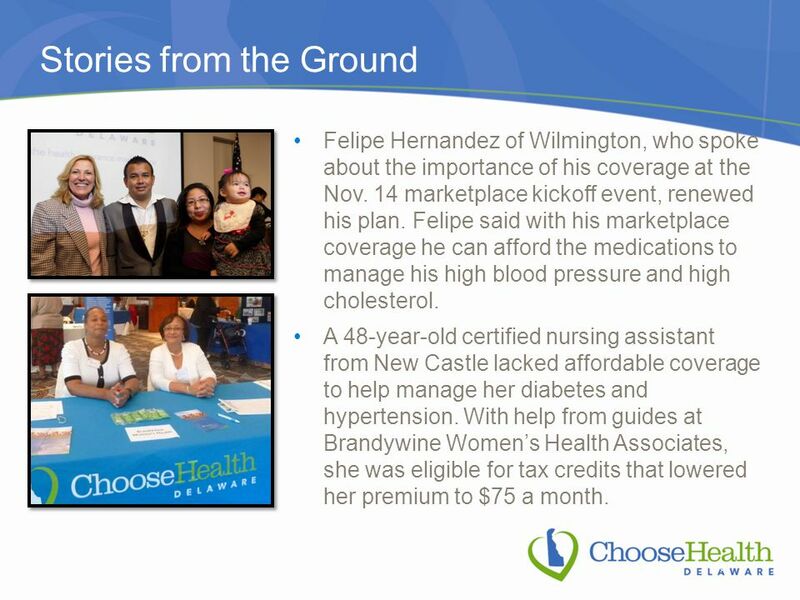 6 Stories from the Ground 6 Felipe Hernandez of Wilmington, who spoke about the importance of his coverage at the Nov. 14 marketplace kickoff event, renewed his plan. 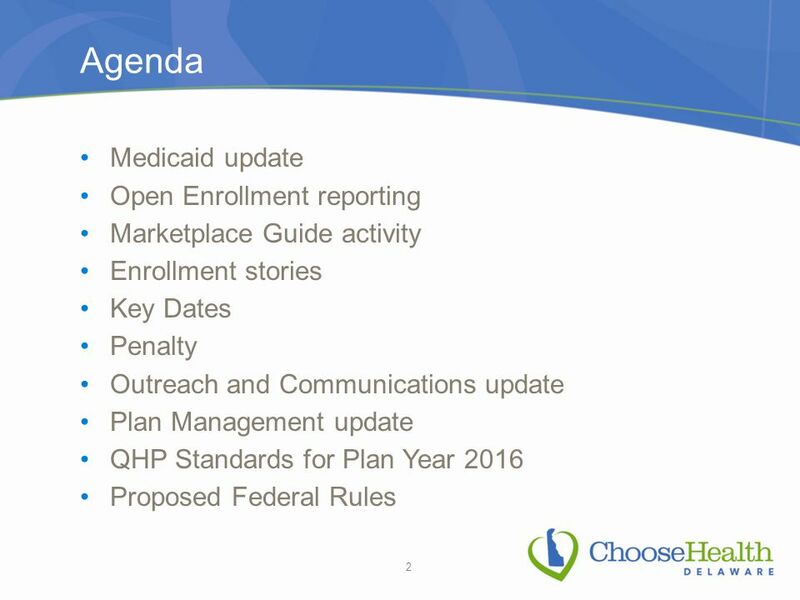 Felipe said with his marketplace coverage he can afford the medications to manage his high blood pressure and high cholesterol. 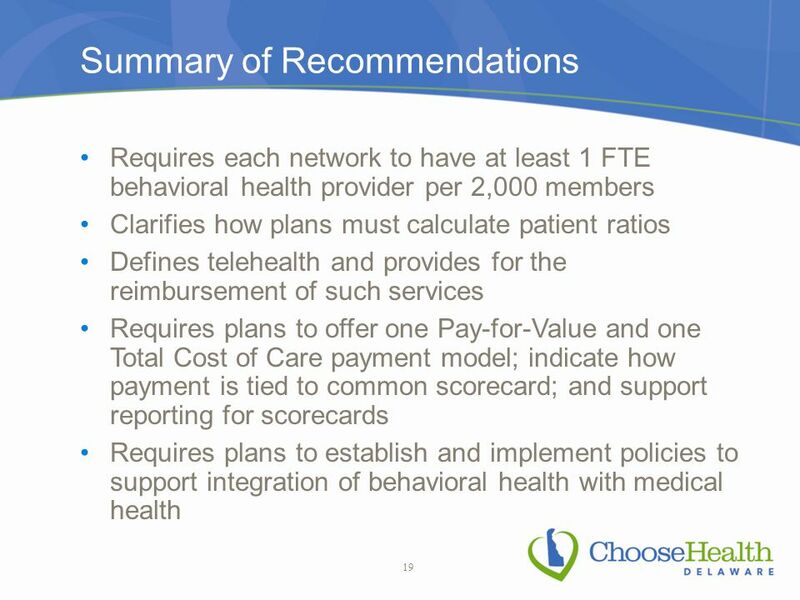 A 48-year-old certified nursing assistant from New Castle lacked affordable coverage to help manage her diabetes and hypertension. 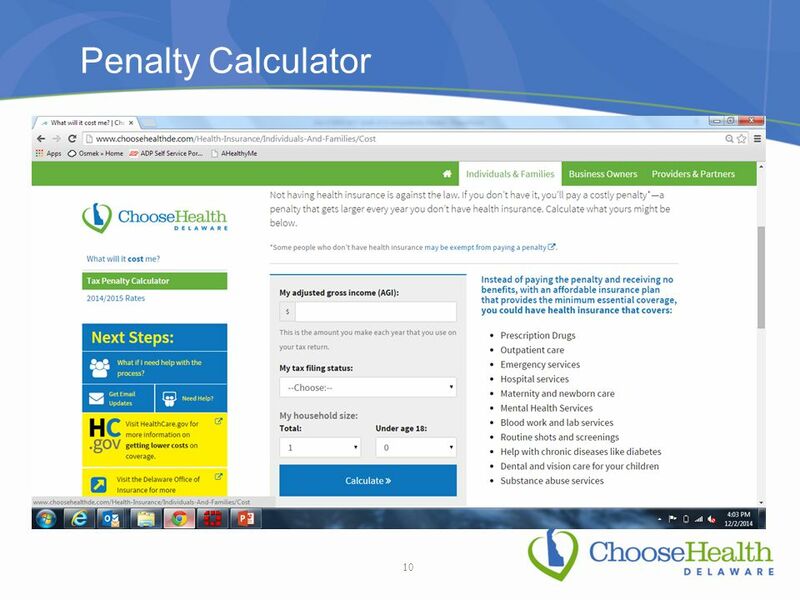 With help from guides at Brandywine Women’s Health Associates, she was eligible for tax credits that lowered her premium to $75 a month. 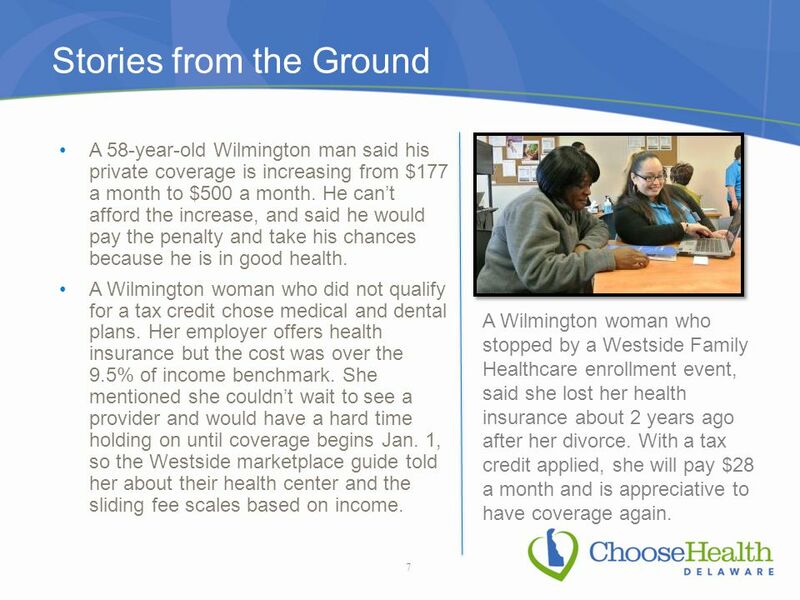 7 Stories from the Ground A 58-year-old Wilmington man said his private coverage is increasing from $177 a month to $500 a month. 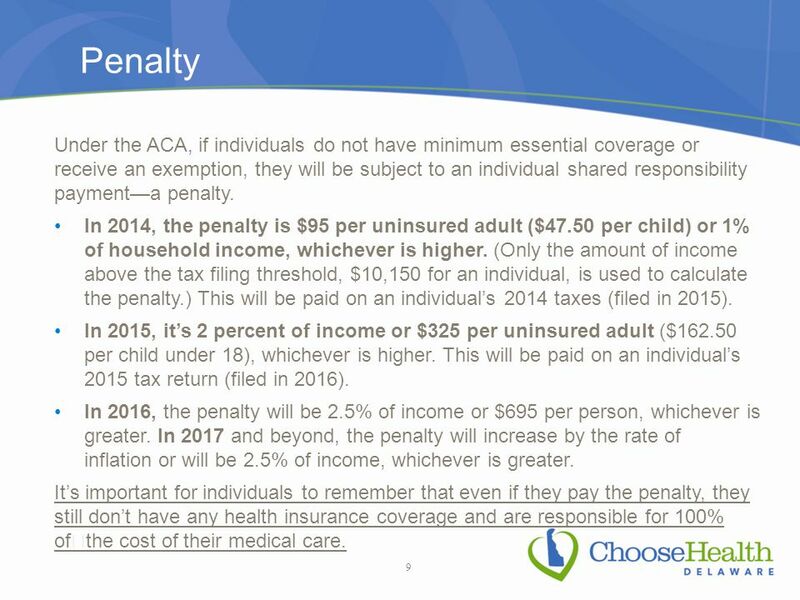 He can’t afford the increase, and said he would pay the penalty and take his chances because he is in good health. 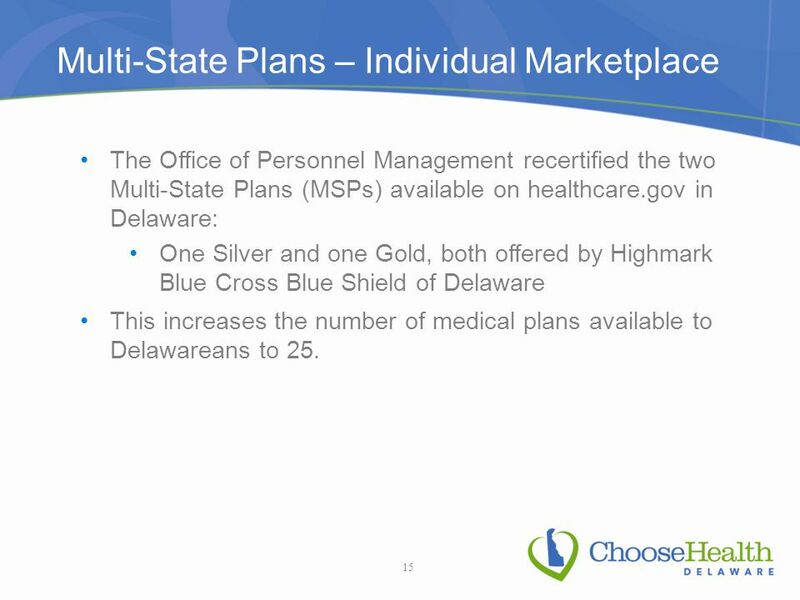 A Wilmington woman who did not qualify for a tax credit chose medical and dental plans. 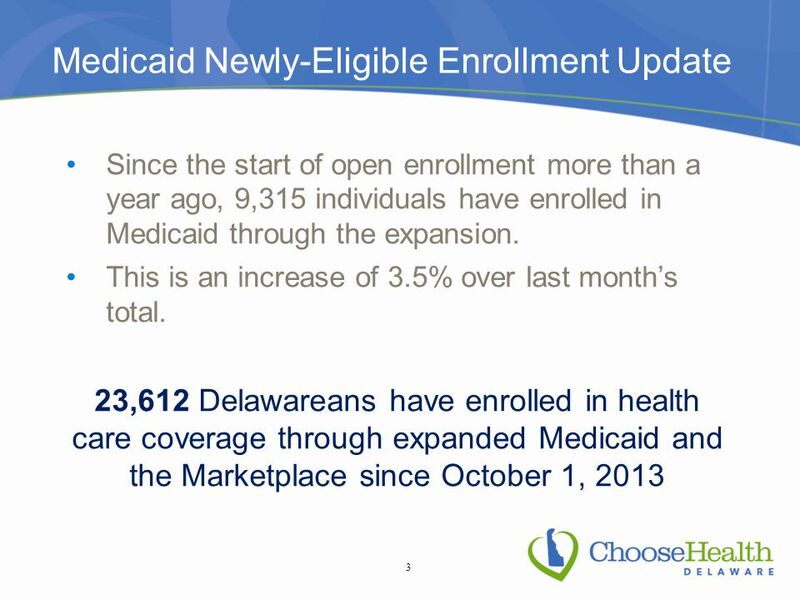 Her employer offers health insurance but the cost was over the 9.5% of income benchmark. 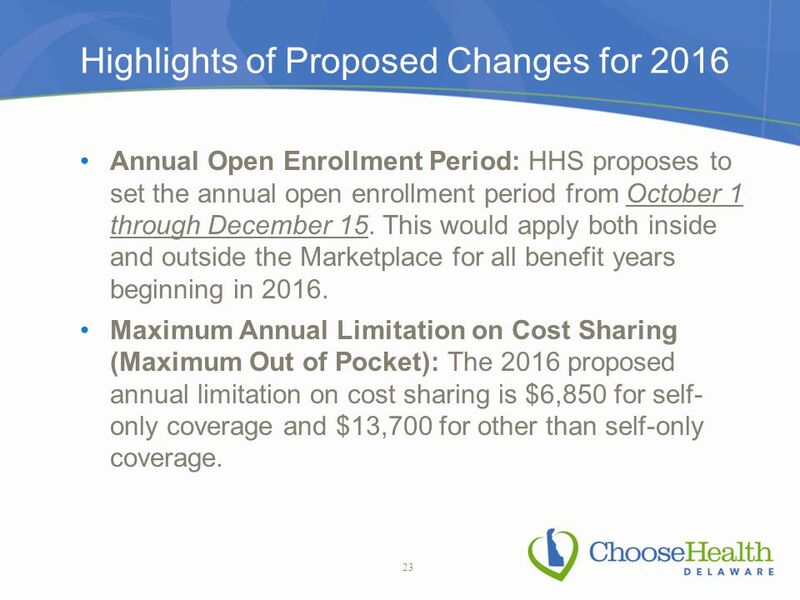 She mentioned she couldn’t wait to see a provider and would have a hard time holding on until coverage begins Jan. 1, so the Westside marketplace guide told her about their health center and the sliding fee scales based on income. 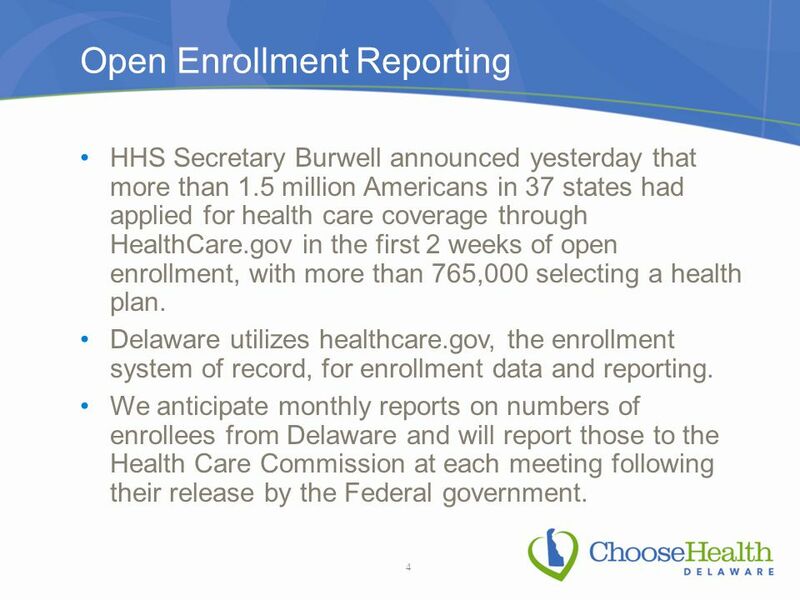 7 A Wilmington woman who stopped by a Westside Family Healthcare enrollment event, said she lost her health insurance about 2 years ago after her divorce. With a tax credit applied, she will pay $28 a month and is appreciative to have coverage again. 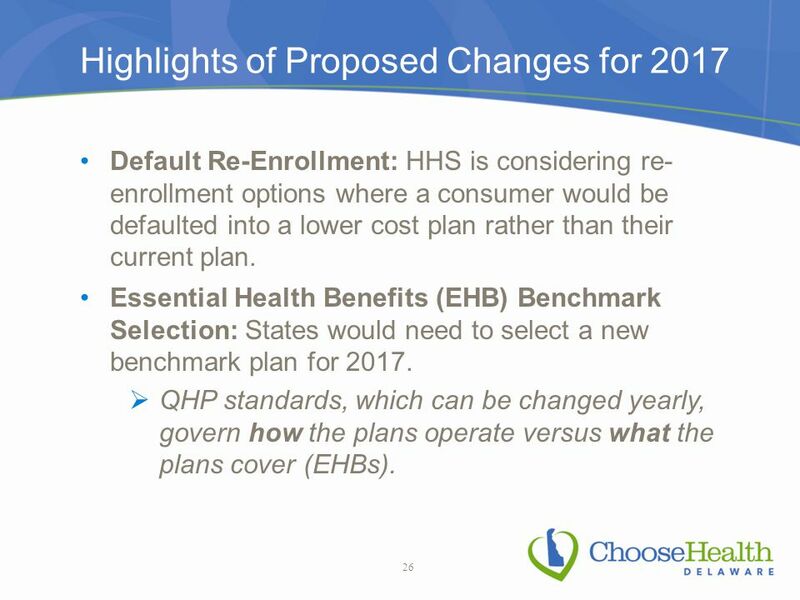 8 Key Dates DateMilestone December 15, 2014Deadline to enroll for coverage to begin on January 1, 2015 Last day for employers to enroll in SHOP without the minimum employee participation requirement (70%) December 31, 2014All Marketplace Plans will expire regardless of when a consumer enrolled January 1, 2015First date of coverage for those completing enrollment by December 15, 2014 February 15, 2015Open Enrollment for coverage in 2015 ends 8 Medicaid enrollment is open all year. 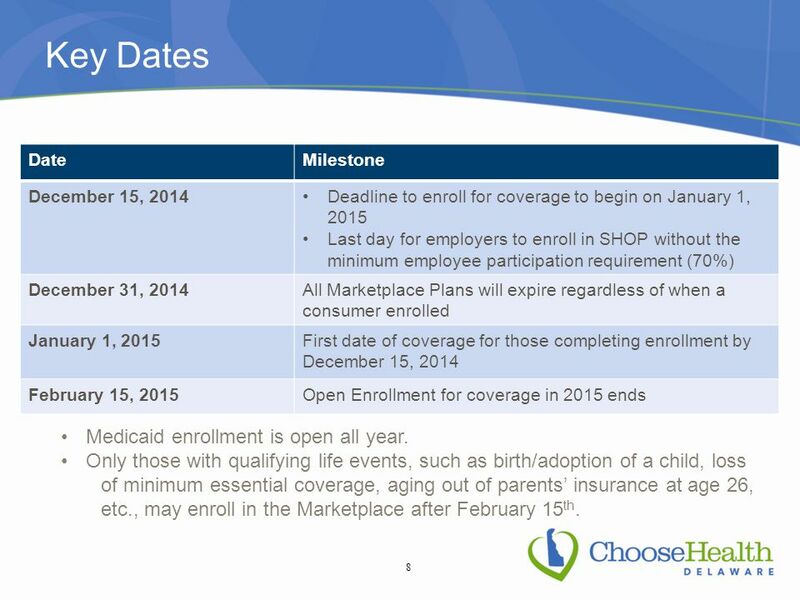 Only those with qualifying life events, such as birth/adoption of a child, loss of minimum essential coverage, aging out of parents’ insurance at age 26, etc., may enroll in the Marketplace after February 15 th. 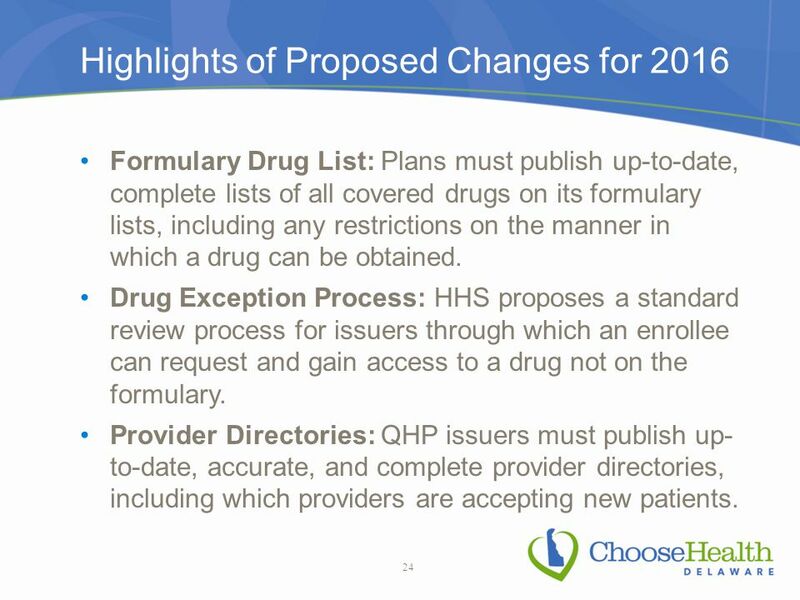 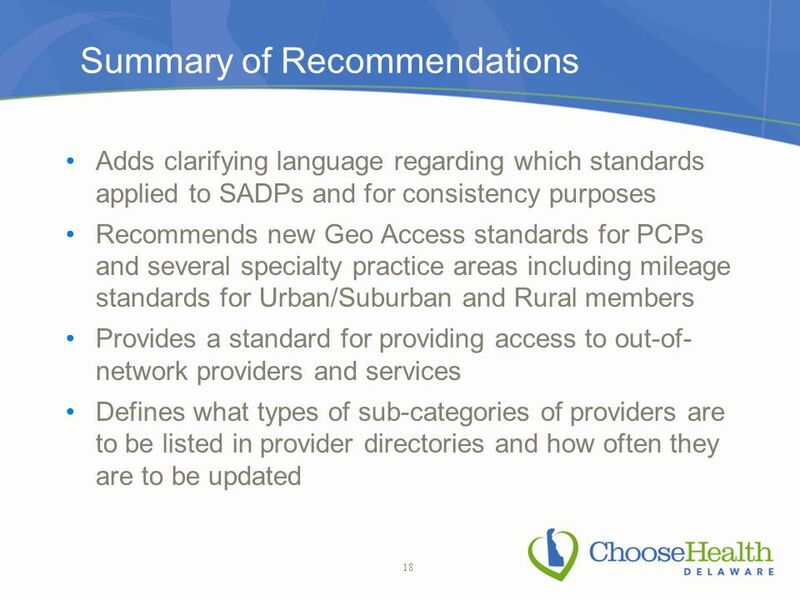 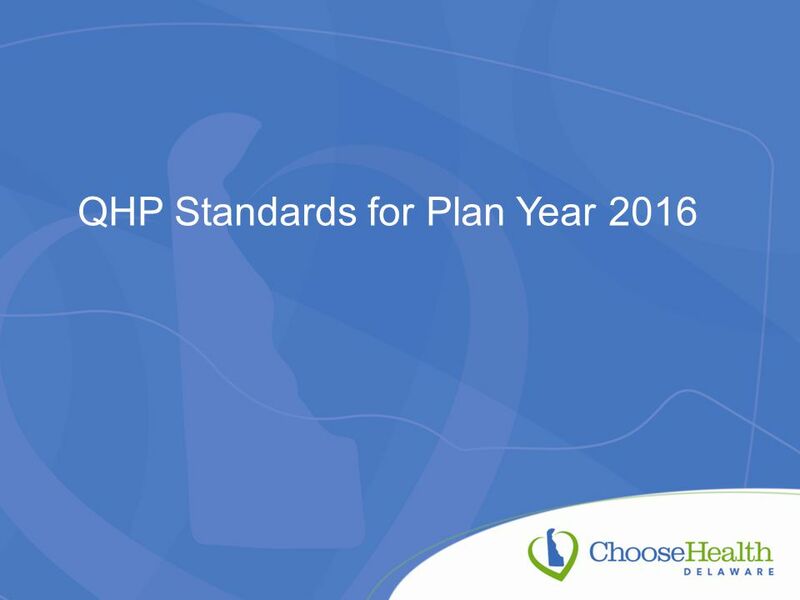 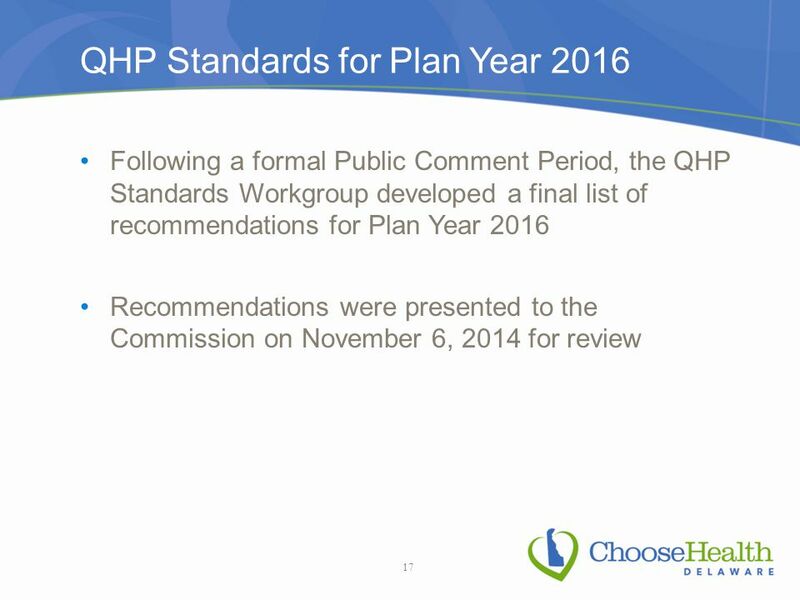 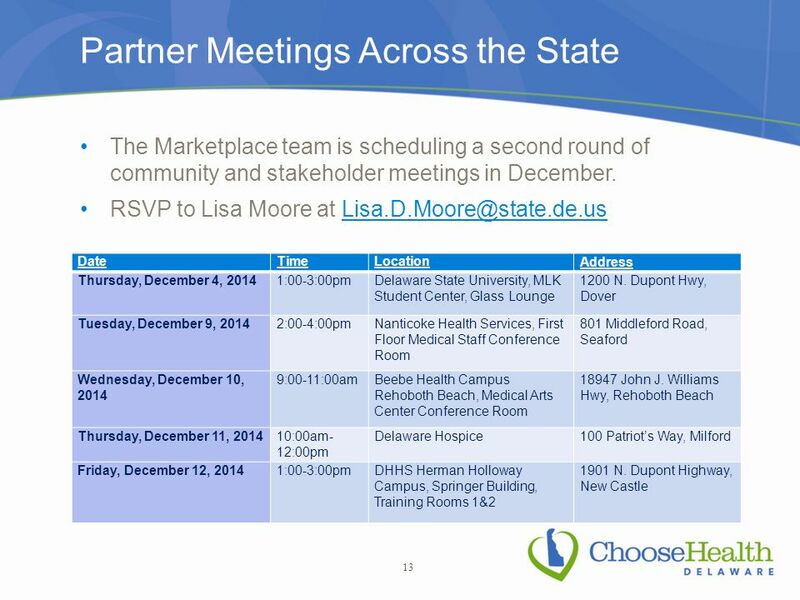 Download ppt "Delaware’s Health Insurance Marketplace: Update on Activity Delaware Health Care Commission December 4, 2014 Secretary Rita Landgraf, Department of Health." 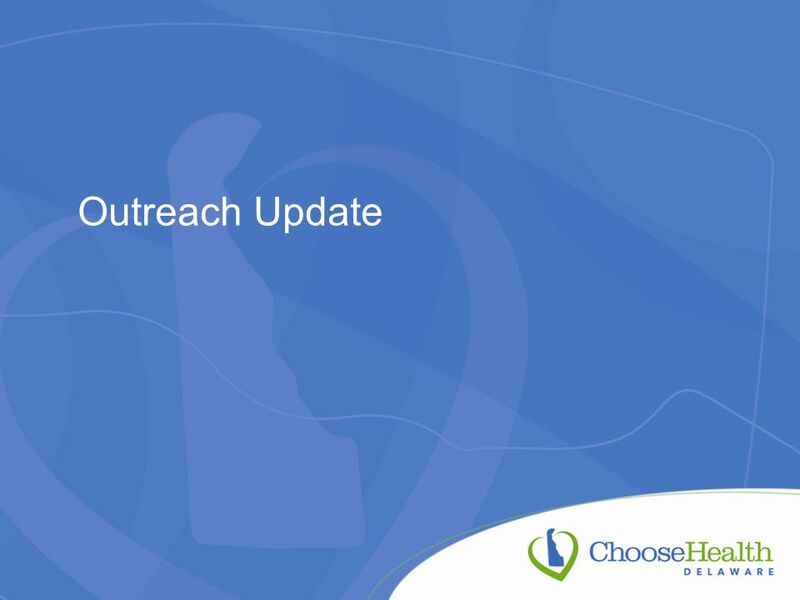 Connecting Muslims to Coverage Presentation by American Muslim Health Professionals. 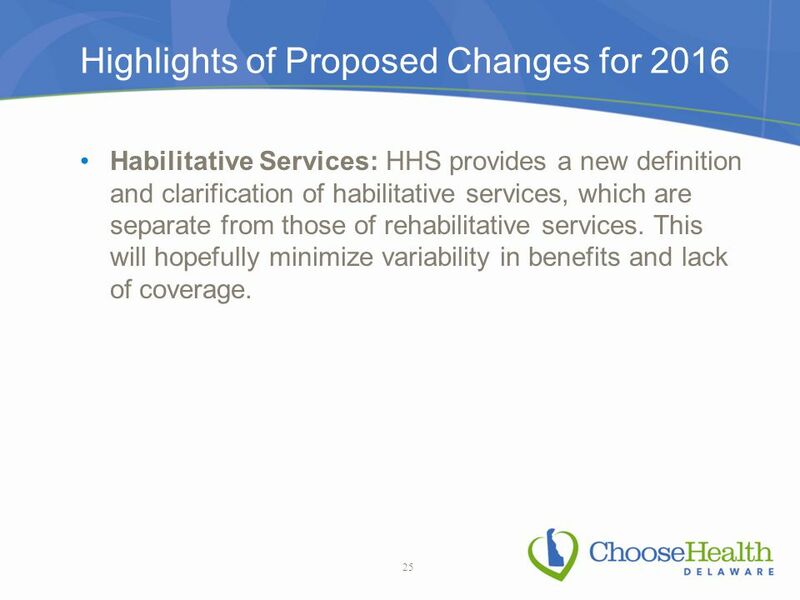 Potential Impact of the Affordable Care Act on the Ryan White HIV/AIDS Program November 27, 2012 All Grantee Meeting Presentation: HIV/AIDS Bureau, HRSA. 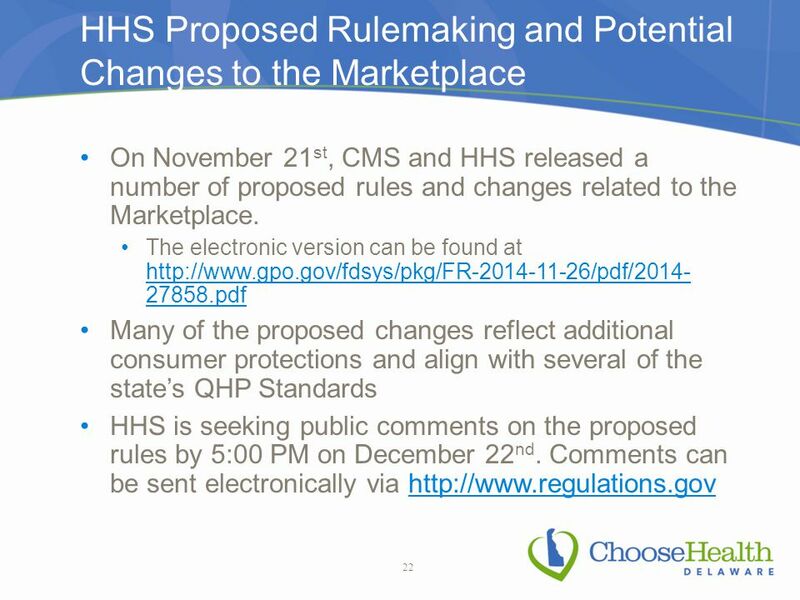 Delaware’s Health Insurance Marketplace: Update on Activity Delaware Health Care Commission, November 14, 2013 Secretary Rita Landgraf, Department of Health. Using MyJob for Annual Benefits Enrollment Sign into MyJob doej PasswordUser NamePress Login button. 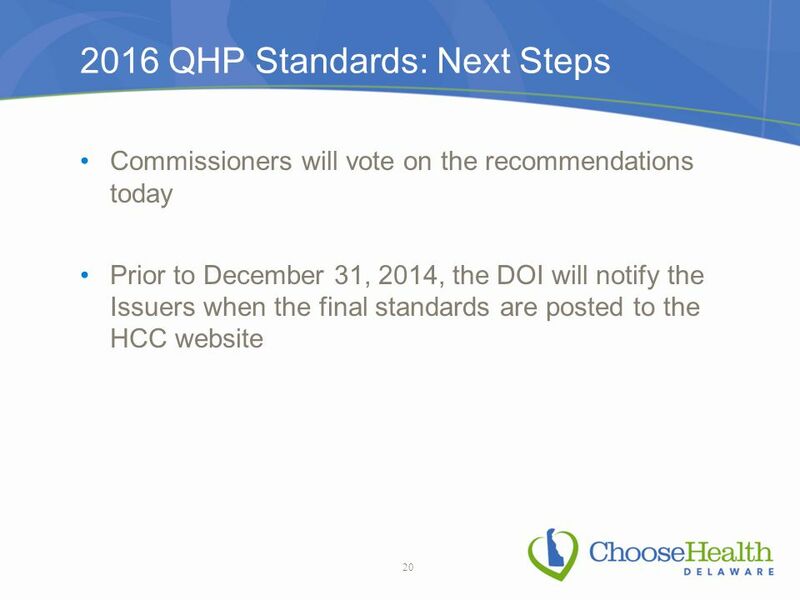 Delaware’s Health Insurance Marketplace: Update on Activity Delaware Health Care Commission, December 16, 2013 Secretary Rita Landgraf, Department of Health.